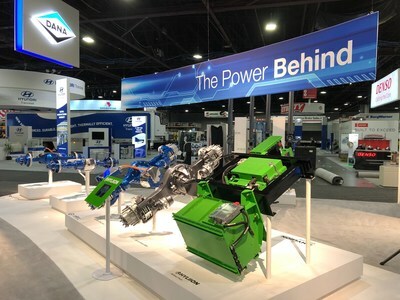 AUSTIN, Texas, March 28, 2019 /PRNewswire/ -- Hyliion, a leader in Class 8 electrification, and Dana Inc., received attention from both fleets and original equipment manufacturers at the American Trucking Association's Technology and Maintenance Council Meeting in Atlanta this past week. Customers expressed interest in ordering the system to run extended trials on their fleets. Hyliion and Dana jointly participated in a range of conference programming to discuss Dana's recent investment in Hyliion, including a highly attended ride and drive and press event. Dana's investment reinforces the strategic relationship between the two companies to advance vehicle electrification in the transportation industry. Mark Wallace, Dana's President of Commercial Vehicle Driveline Technologies, will join Hyliion's board of directors. The deal allows Dana to leverage Hyliion's extensive knowledge of advanced vehicle electrification dynamics and data analytics to provide fully integrated solutions to the industry. Going forward, Hyliion will utilize Dana components for driveline and electro-dynamic technologies, including motors, inverters, controls, gearboxes, and thermal-management systems in future product offerings and will gain access to Dana's global sales and service footprint, manufacturing expertise, and state of the art research and development facilities. On the show floor, Hyliion CEO, Thomas Healy, shared, "Hyliion is the class 8 electrification leader with revolutionary advancements in battery technology and fully instrumented machine learning-based software enabling fuel savings and emissions reductions that substantially reduce operating costs of a trucking fleet. Hyliion's innovation combined with Dana's 115-year history of delivering efficient, high-performance drivetrain components will allow both companies to realize a greener future on an accelerated timeline." "Our investment in Hyliion is emblematic of our commitment to innovative hybrid and electric vehicle solutions that are revolutionizing power conveyance and delivering efficiencies in operating costs while enabling decarbonization for fleets. The reception of our partnership at this conference demonstrates the demand we are seeing from fleets for real-world electrification solutions. Hyliion and Dana are perfectly positioned to deliver just that to the industry," said Mark Wallace. Hyliion's new financing round is comprised of Dana, existing investors, and new financial and strategic investors. With this financing, Hyliion will have raised over $50 million since its inception. Funds raised will be used for fulfilling customer demand, furthering joint research and development with Dana, and expanding Hyliion's battery solutions for additional heavy-duty transportation applications. Hyliion offers fleets an easy, efficient way to decrease fuel expenses and lower emissions by turning semi-tractors into intelligent electric hybrid vehicles. Hyliion's patented technology can be used on new or existing vehicles. Requiring no driver training, Hyliion products reduce fuel consumption, reduce emissions, and provide a positive return to fleets and the environment immediately. Hyliion was among the Top 20 Product Award winners from Heavy Duty Trucking Magazine for its 6X4HE Intelligent Hybrid Electric Truck Solution and was recently named to RED HERRING's prestigious Top 100 List. For more information, visit hyliion.com.